Water surrounding a home or seeping into a basement can cause the structural integrity of a home to diminish. From interior to exterior waterproofing B-Level, Ltd does it all. For over 14 years B-Level, Ltd. has provided waterproofing services to customers around Ohio. 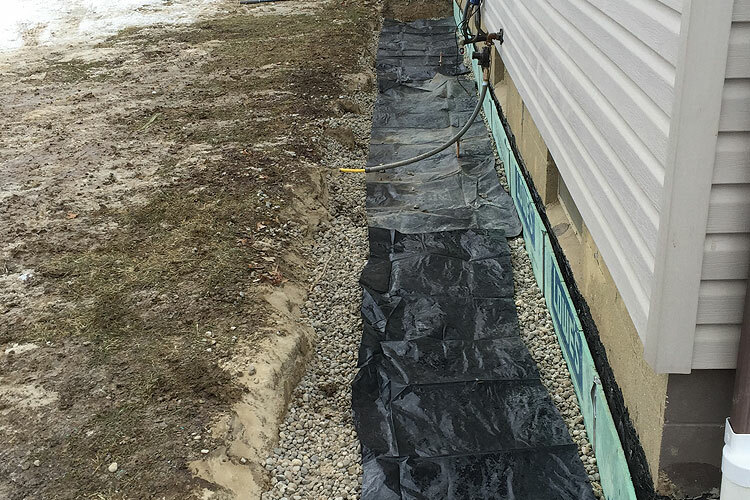 A common choice when renovating a pre-existing structure is a French drain style system. The process of installing a French drain system starts with opening up the floor approximately 12 inches off the wall and removing the concrete debris. Once the concrete debris is removed, a trench is created by digging out the old fill material: dirt, gravel, etc. Once a clean trench is present, weep holes are drilled into the existing block wall. After the weep holes are drilled fresh gravel, perforated drain tile, and a protective membrane are installed. The perforated drain tile is sloped in a manner to redirected the water from the weep holes to a sump pump location. The protective membrane is placed on the wall to protect the weep holes and allow for an unimpeded pathway that the water flow through. After the items are installed, and the system is tested, B-Level, Ltd. then replaces the concrete that was removed during the installation process. B-Level, Ltd. does not take a one-size fits all approach to interior waterproofing systems. If the situation and your needs dictate that only a certain area of your basement needs an interior system, then we will only treat that area. If your basement has special requirements then we can accommodate those needs as well. For all your waterproofing needs call B-Level, Ltd. today at 614-837-1269. Water surrounding a home or seeping into a basement can cause the structural integrity of a home to diminish. From interior to exterior waterproofing B-Level, Ltd does it all. To truly waterproof a home one needs to stop the water at the source which is from the outside. For over 14 years B-Level, Ltd. has provided waterproofing services to customers around Ohio. An exterior waterproofing system starts with excavating the entire perimeter of the home. The excavation trench will extend all the way to the footer, not just three feet below grade. The foundation wall is cleaned, cracks are patched, and a three part protective membrane is then applied. A perforated exterior footer drain is then installed at the base of the trench. The exterior footer drain is sloped towards a sump pump area where the water is then discharged out and away from your home. The trench is then backfilled with gravel and fresh top soil. B-Level, Ltd. does not take a one-size fits all approach to exterior waterproofing systems. If the situation and your needs dictate that only a certain area of your basement needs an exterior system, then we will only treat that area. If your basement has special requirements then we can accommodate those needs as well. For all your waterproofing needs call B-Level, Ltd. today at 614-837-1269. Before and after photos highlighting our Interior/Exterior Waterproofing service.